How often should I grease my bearings, and how much grease do they need? FOR STARTERS, note that most sealed bearings come pre-greased from the factory with a 25%-35% grease fill. This is all the grease the bearings will ever need, because the relubrication interval (explained below) is longer than the expected life of the bearing. DON’T JUST GUESS. It can be tempting to give the bearings a pump of grease each day, or to pump until grease comes out from under the seals. However, this effectively destroys the seal’s ability to keep contaminants out of the grease; and too much grease “churns” inside the bearing, generating resistance and leading to rapid heat build-up. FREQUENCY: The accompanying chart shows approximate relubrication intervals. 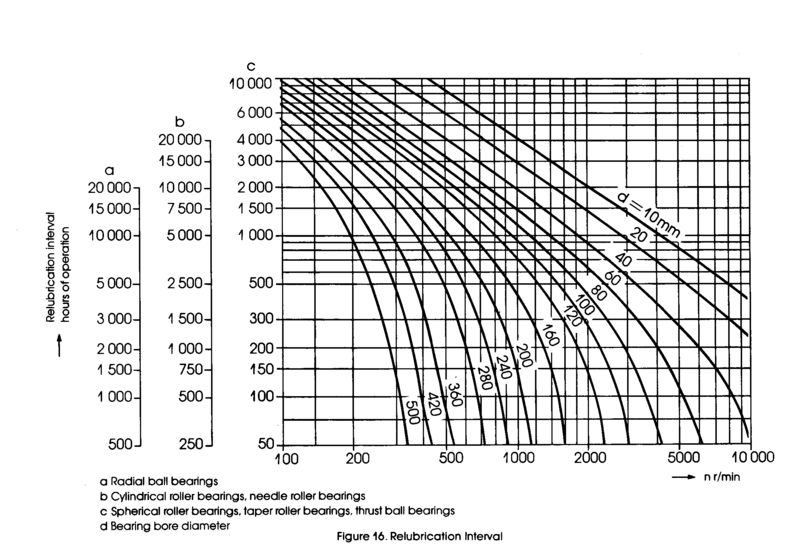 Start at the bottom by choosing your speed; follow the line straight up until you meet the curve that matches your bearing O.D., then go straight left to see the relubrication interval for your bearing type. AMOUNT: To find ounces, [(OD in inches) x (width in inches) x 0.114]. To find grams, [(OD in mm) x (width in mm) x 0.005]. FOR EXAMPLE, suppose your application has a 6209 ball bearing, running at 1,750 RPM in a clean, smooth machine for 24 hours a day, 7 days a week. A 6209 bearing has a shaft diameter of 45mm, an OD of 85mm, and a width of 19mm. Using the chart and the formula, the bearing only needs 8 grams of grease every 10,000 hours. If your grease gun delivers around 1.35 grams per stroke, that means the bearing needs 6 strokes every 13 months; you could average it out to a stroke every 8 weeks or so. When greasing a bearing by means of a zerk, make sure the zerk and the grease gun nozzle are clean, and if possible, make sure the zerk is always covered between greasings. Otherwise, you could be pumping dirt and contaminants straight into your bearings.